Individual actions wont change the world, so Awesome students in DC are going to reinvent it. Katie Kindle, a teacher in a DC school, wants to empower her students to become change makers in their communities. When she started a project with her students to identify a problem they see in the world around them, and then generate an action they could take to change the course of the problem, they unanimously responded that their individual actions won’t change the world. So Katie created this project to proving them wrong and giving them an experience with creating a vision and seeing it through to completion. Students will experience what it feels like to generate an idea, implement it in the world, and then see what happens. We have no delusions that their individual actions will solve complex problems like world hunger, but we are opening up the possibility that the actions of one committed individual can be the ember that sparks change and inspires others to join the campaign to take responsibility for making the world a world that works for all of us. Over the course of this school year, six seniors will identify problems in the world that give them that feeling in the pit of their stomachs that something is not right and needs to change. Then they will research those problems both through reading research on the topic and by interviewing people affected by the problem and those working to try and solve it. Once they have gathered information and become experts on their topics, students will go through the creative process of generating an action plan for how they, as individuals, could change the course of this problem. Their action plans could involve public art, awareness campaigns, internet campaigns…almost anything you can imagine is possible. Once their action plans are defined, students will pitch their idea to a panel of Awesome Foundation members for feedback. At this point students can apply for funding if their project requires it. All students will be pitching to convince the panel that they are ready to implement their plan. The panel will either give them the green light because their projects are well thought out and ready to go or they will offer feedback on places where the student may need to think through their plan a little more carefully. Once students have revised their projects, they will spend the month of March putting their plans into action. 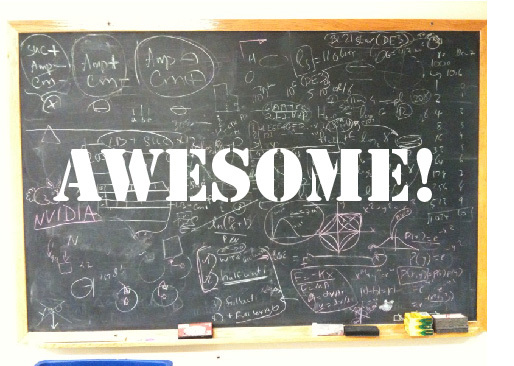 What does winning the Awesome Foundation DC grant mean to you? Winning the Awesome Foundation DC grant means the world to me because it means that my students will have an authentic opportunity to put their ideas into action. It also means that I get to tell my students that complete strangers believe in their ideas and what they can do. This is unbelievably powerful. When I told my students about winning the grant they had no idea I had applied and their faces reflected back complete joy and amazement. I had been talking to them for over a month about our thesis project and most of the excitement was on my end. My students were feeling more daunted by the process than excited and they were definitely skeptical that this crazy idea their teacher had thought up would actually work. Having the Awesome Foundation behind us gave the whole project a different vibe and communicated to the students that it is possible for them to come up with ideas for change that could really make a difference. How will you use the Awesome Grant? What sort of impact do you hope you will have in DC? My first hope is that I will be able to impact how my students see themselves and their role in the world. I want them to experience what it means to be an engaged global citizens and to have the confidence that their ideas are valid and can make a difference. As an extension of the direct project my students have embarked upon, I hope to inspire other teachers and students to take the learning that is happening in the classroom out into the world. I hope to show that it is possible to empower student voice both in the classroom and in the world by creating authentic opportunities for them to explore, experiment, analyze, create, and reflect on topics that matter to them. What other support do you need? The other support that I need is for people who have expertise or experience with any of my students’ topics to join us. My students need to be able to talk to people about their topics as part of their research. They may also need people to participate in their projects. We would love to collaborate with anyone who would like to help advise students on their projects, anyone who would be willing to be interviewed during the research phase, or anyone who wants to participate once the students have designed their action plans. If you would like to get involved, please @ us at @afdndc.